Welcome to the land where the Astewyld (or Asters) - a large breed of wolf similar to that of a dire wolf - roam this atompunk-themed nuclear wasteland. The year is 0 of the New Age, when the planet known as Earth finally fell to waste. Its surface drained of resources, its inhabitants gone. They had fled. The native species - many they had become - moved to the stars in the start of a new age. An Age of Discovery, of Exploration. The human species was the most prominent, taking over planets and settling on many. One in particular, a barren planet that orbited a binary star. This planet was almost donut in shape, with its outer equator being a desolate desert, with very little water. The inner equator, was an icey wasteland as well, though most water pooled here beneath the ice. Beneath the ice flows, caverns of the most beautiful alien plantlife grew - filling the underdark with the bright and lively - and sometimes dangerous - sights. The stretches between, while filled with plantlife that towered above the landscape, were nearly inhabitable - boasting a gravity that was nearly doubled compared to the equatorial gravity. What lives there can move to and from this area - their danger nearly doubling in the lower gravitational zones. But what lives on the equator is much slower on the flats, as the gravity weighs down on them. They cannot stay in that area for too long without having trouble with their health. A fleet of ships decides this planet is a suitable place, and lands. Well, attempts. They misjudged their entry, and the fleet was pulled into the surface. No way off the planet, the fleet simply started their own life here. It was their intention, after all. In 17NA, the planet Chion, and its civilization, began. By the year 678NA, the planet had become fully civilized, though the equators were isolated - forming two completely different cultures. The inner equator - the Ice Flows - were a community driven on helping each other, not letting the frigid temperatures destroy them. The outer equator - the Scorch - were much different. Everyone fends for themselves. Food is scarce, water is scarcer, and the border into the Flats - the heavy gravity area between the equators - was heavily guarded by an alliance that wanted to control what little water the Scorch had. This alliance, called the Astewyld, was also a scientific group - leading a group of experiments in compounds they called Havens. These havens were the birthplace of the Asters - a species of dire wolves. When the Astewyld fell, as does all those who oppose those determined to survive, the Havens fell apart, and the Asters fled into the wilderness. By the year 3874NA, the Asters - also named the Astewyld after the group that created them - roamed the planet freely, becoming a big part of the world around them. 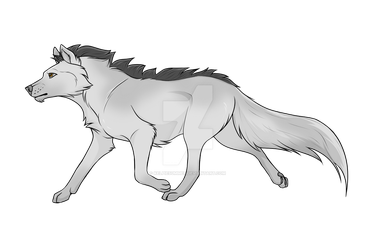 In the mountainous regions that spanned all three zones, the Reapers were mutated - a version of these wolves that held wings - able to cross the mountains with ease. From the Flats, the Dires were born - a larger and sturdier version of the Asters that covered the rest of the land. They needed to be able to withstand the higher gravity of the flats after all! The rest of the species has filled in the Flows and and the Scorch zones. The Asters as a whole have been both helpful and detrimental to the humans and other sentient forms (more species had joined the humans in living here), and there ranged from wild to tamed Astewylds - as well as ones that have even been exported off-planet. Wild Asters are extremely intelligent, and have communities and civilizations of their own. Tamed ones are fairly intelligent as well, though they don’t mind their captivity, nor can they properly ‘converse’ with the wild (unless they were born wild and then tamed). It is like a difference in language between the two types. Tamed ones vary in usage. In the Scorch, these wolves are used as either pack animals or else travel animals. Some are even used as just companions. Better of settlements participate in races, jumping, and ‘dressage’, as well as other competitions. The Ice Flows are similar, though here, every house has an Aster, which is used as a heat source for the freezing cold. Sometimes, a house will even have several Asters to help warm the place up. In the Flats, there is nothing but Wild Asters. Wild Asters form their own communities, their own civilizations. They take over abandoned Havens as ‘dens’, and each pack has its own rankings and systems. Sometimes, though, small organizations will repair a Haven, and run their own experiments. Ok.Let me know when you're accepting members.